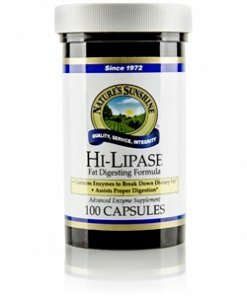 Nature’s Sunshine Hi-Lipase helps the body efficiently digest lipids. Lipase, a class of enzymes that breakdown fats, are normally produced by the salivary glands, the pancreas, and the stomach and by certain plants. 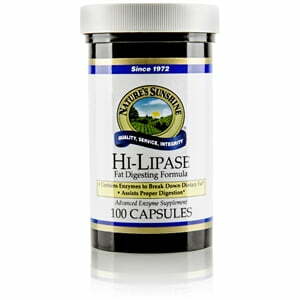 Hi-Lipase includes 240 LU of lipase to assist in digestion of fat-containing foods, such as nuts. Instructions: Take one or two capsules before consuming high fat foods. May also be used between meals. Red Beet fiber (Beta vulgaris), cellulose (plant fiber), potassium citrate, Caraway seed (Carum carvi), Dandelion root (Taraxacum officinale), Ginger rhizome (Zingiber officinale), Gentian root (Gentiana lutea), Fennel seed (Foeniculum vulgare), gelatin, and water.